CHARLOTTE, N.C., Nov. 14, 2017 /PRNewswire-USNewswire/ -- The Greg Olsen Foundation, in partnership with Carolinas HealthCare System's Levine Children's Hospital, announced today The HEARTest Yard Fund has pledged to support a cardiac neurodevelopmental program, which will be the most comprehensive program of its kind in the Southeast. The HEARTest Yard and Levine Children’s Hospital are creating a new program for kids with congenital heart conditions. Thanks to modern medicine, “heart kids” – children with congenital heart defects – are living longer than ever before. But as these kids continue to defy the odds, they’re facing unexpected educational and behavioral challenges – challenges that often aren’t addressed or even diagnosed until later in life. 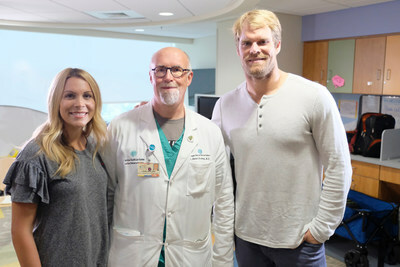 From Left: Kara Olsen, Dr. Rene Herlong, Chief of Pediatric Cardiology with Sanger Heart & Vascular Institute at Levine Children's Hospital, and Greg Olsen got together to talk about their vision of bringing a cardiac neurodevelopmental program for heart patients at Levine Children's Hospital. It will be the most comprehensive program of its kind in the southeast. The HEARTest Yard, which was founded by Carolinas Panthers All-Pro tight end Greg Olsen and his wife Kara, provides families of infants treated for severe or complex congenital heart disease at Levine Children's Hospital with services including in-home, private nursing care, physical therapy and speech therapy at no charge. As their own son who was born with a congenital heart defect has grown, they realized a need for additional programs and services to ensure children can reach their fullest potential. "At The HEARTest Yard, we continually think bigger. 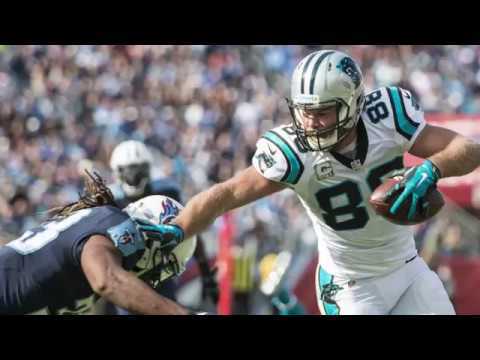 The status quo is never enough because we have lives at stake," Greg Olsen said. "While a few years ago we kicked off the program helping infants, our foundation is growing just like our heart babies. We're dedicated to helping them over the course of their life. We see tremendous value in the expansion of The HEARTest Yard. That's why we've already gifted $750,000 to kick start the funding for the cardiac neurodevelopmental program and we look forward to raising the millions more needed to establish and build this program into one of the nation's best." Beyond the physical challenges, up to 50 percent of pediatric heart surgery patients may have neurodevelopmental deficits during their lifetime, which can impact language, fine motor skills, or vision. They may be diagnosed with behavioral issues from depression to attention deficit hyperactivity disorder, or they may develop learning disabilities that limit their educational opportunities or even their job choices. Early diagnosis. By conducting the right tests at the right time, experts will learn the extent of a child's problems early on so they can intervene at the point of greatest impact and set appropriate expectations for parents. Coordinated care. By arranging tests and interventions through a single clinic, the care team will receive a complete picture of a child's well-being while also making it easier on parents' lives. Leading research. One of the clinic's goals is to learn more about this growing patient population and conduct research to develop the most effective, evidence-based treatments. "A program of this caliber would not be possible without the leadership and philanthropic support of The HEARTest Yard and the generosity of this community," said Gene Woods, Chief Executive Officer and President, Carolinas HealthCare System. "As Greg and Kara passionately understand, every child deserves to live a healthy, carefree life. This remarkable gift will serve as a springboard to bring the highest level of comprehensive services to Levine Children's Hospital, ultimately helping us to improve health, elevate hope and advance healing for the children who need it most." Levine Children's Hospital has been named a Best Children's Hospital by U.S. News & World Report in multiple specialties, including cardiology and heart surgery. With the only pediatric heart transplant program in the greater Charlotte region and the most technologically advanced catheterization labs in the Carolinas, the hospital is one of the top-ranked cardiology and heart surgery programs in the nation. Combining the clinical expertise and care with a unique neurodevelopmental program will give patients and their families the best opportunity to not just grow, but to thrive. "Forty years ago, the challenge was getting these kids to survive. Now, the majority of cardiac kids survive, and the challenge has moved from inpatient critical care to lifetime issues," said Paul Kirshbom, MD, chief of pediatric cardiac surgery at Levine Children's Hospital and Sanger Heart & Vascular Institute. "A program like this brings everybody together in the same place, same time. With one visit, patients will get everything done, find out what their issues are, and work on them. Having a neurodevelopmental clinic for a child's long-term care is going to set this program apart certainly in this region – and probably in the country."